A bright, warm, well-balanced tone. Bringing you D'Addario's most popular light gauge mandolin string set from the world's leading manufacturer of fretted strings. Experience just the right amount of string tension for smooth, easy playability. Made in the USA to bring you high-quality performance and tone. Additionally, a loopend construction provides universal fitting. Enjoy precision wound strings that are corrosion resistant - long lasting with superb sound and brilliant intonation. D'Addario mandolin strings are trusted by legends like David Grisman, Ricky Skaggs, Ronnie McCoury, Doyle Lawson, Rhonda Vincent, Mike Marshall, Adam Steffey, and many more. This is because of their natural acoustic tone and incredibly reliable performance. D'Addario Strings are made from the highest quality plain steel, stainless steel, nickel plated steel, or phosphor bronze and are available in a wide variety of gauges. D'Addario is world's largest manufacturer of musical instrument strings. Known as The Players Choice with a reputation for unsurpassed quality and consistency. D'Addario's innovative, environmentally friendly packaging reduces waste and provides protection from corrosion. All D'Addario strings are manufactured in the U.S.A. using proprietary, digitally controlled, state-of-the-art machinery for unmatched performance, set after set. 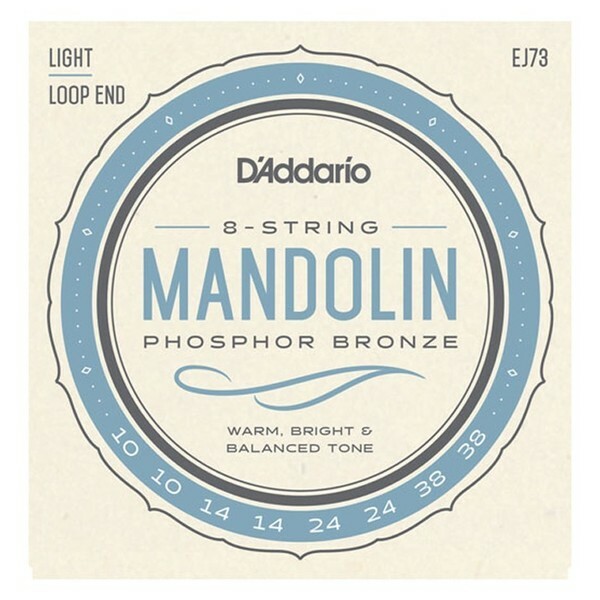 The EJ73 Mandolin Strings are D'Addario's most popular light gauge set of strings for mandolin players. Experience the quality of the world's leading manufacturer of fretted strings. Synonymous with a well-balanced, bright, warm acoustic mandolin tone. This specific set delivers the perfect blend of warmth and brightness, ensuring your mandolin is well-balanced and beautifully rich. Precision wound and corrosion resistant with a high carbon steel core. The result is a long-lasting life-span with incredible intonation.